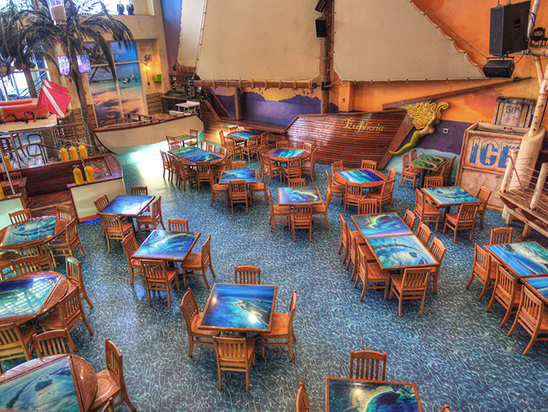 Our second floor Tiki Dining area is the ideal semi-private or private space for any group gathering or celebration. 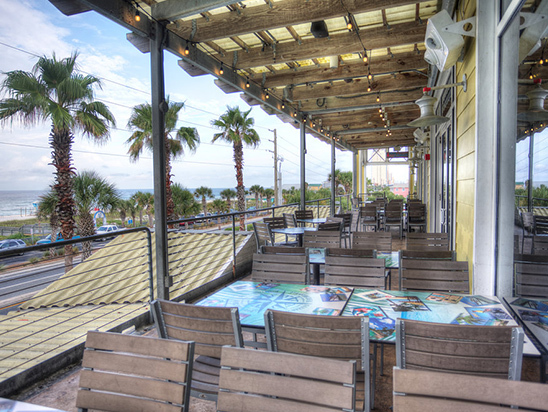 It overlooks the main dining floor and has a wall of windows looking past the attached Bama Breeze Deck and towards the sandy beach and turquoise Gulf water. This area provides an island-escape themed space that needs no additional décor and is great for a destination wedding, class reunion, or holiday celebration. This second floor deck is truly a great space and can be reserved privately or semi-privately for your group. 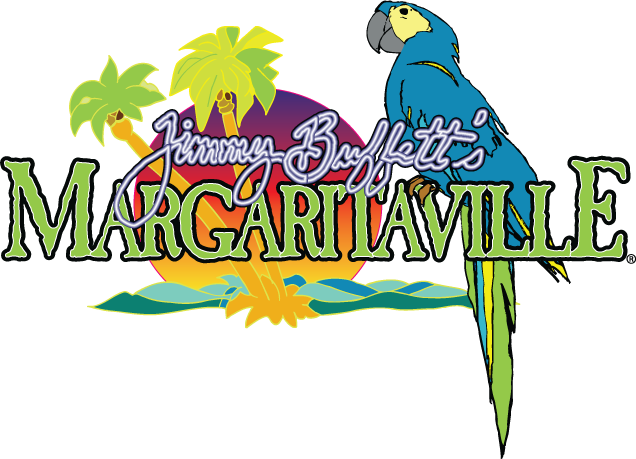 Your guests can enjoy un-obstructed views of the sandy beach and Gulf waters just steps away. 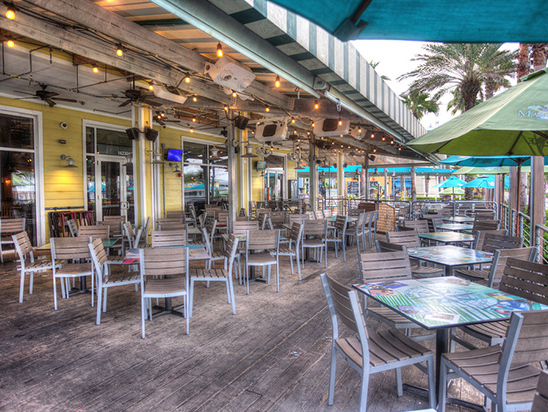 Our Main floor open-air patio is just steps away from the sand and Gulf coast waves. It has an exclusive bar and is an ideal seating option year-round as it is equipped with fans and misters for warmer months. Want to host a beach-side event without being in the sand, this space can offer you just that. 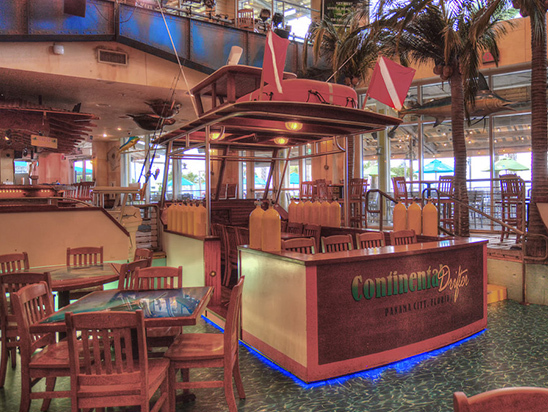 Our Pontoon Boat offers semi-private seating for your group to enjoy while “docked” on our Marina floor. You will be right in the action and able to enjoy our live entertainment on the main stage and stilt walkers making their rounds through the dining room. The Marina floor offers seating options surrounded by docked boats and is in the center of all the action, including our main stage featuring live entertainment and its where our stilt walkers make their rounds. This floor houses our main Bar, offers multiple seating options and is great for large group events.